Livermore, CA – May 31, 2017 – Comcast announced today that it is launching a new internet service that will deliver speeds up to 1 Gigabit-per-second (Gbps) to residential customers throughout most of California. These speeds will be among the fastest and most widely available in the region and include access to the nation’s largest Wi-Fi network of more than 17 million hotspots. Combined with the company’s recently launched Xfinity xFi platform, a new and personalized home Wi-Fi experience, Comcast is giving California customers the fastest speeds, the best coverage, and ultimate Wi-Fi control in their homes. The company’s new 1 Gigabit internet service will use DOCSIS 3.1 technology to deliver the speeds over the existing communications lines that are already in most people’s homes. To enjoy the service, all customers need to do is install a new DOCSIS 3.1 cable modem. New and current customers in California can visit Xfinity.com/gig to learn about the new service and request additional information. 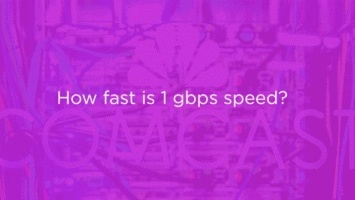 The everyday price for 1 Gigabit service in California is $159.95, without a contract. The company will also test a $109.99 per month promotional price. Additional prices and promotions may be tested in the future. Pricing for current customers with a contract will vary.